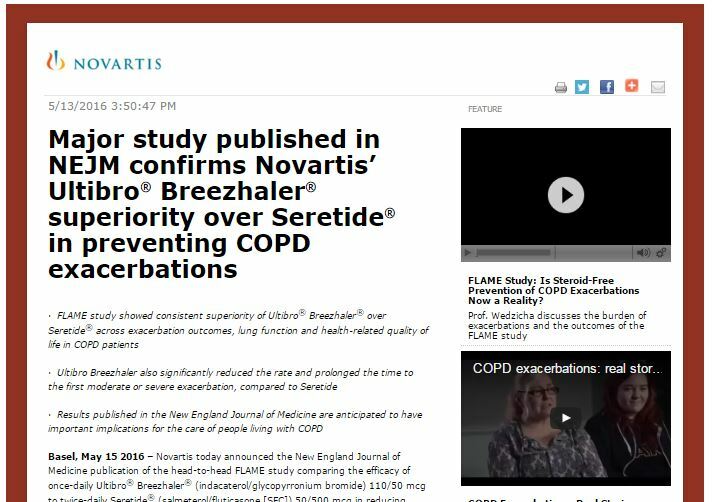 Basel, May 15 2016 - Novartis today announced the New England Journal of Medicine publication of the head-to-head FLAME study comparing the efficacy of once-daily Ultibro® Breezhaler® (indacaterol/glycopyrronium bromide) 110/50 mcg to twice-daily Seretide® (salmeterol/fluticasone [SFC]) 50/500 mcg in reducing chronic obstructive pulmonary disease (COPD) exacerbations. In addition to meeting the primary endpoint (non-inferiority), findings demonstrated the superiority of Ultibro Breezhaler over the widely used inhaled corticosteroid (ICS)/LABA* combination on exacerbation outcomes. The published FLAME results are anticipated to impact the future management and treatment of COPD patients. Preventing exacerbations is one of the primary goals of long-term care for COPD patients. These episodes have a detrimental effect on quality of life and disease progression, contributing to further lung function decline, and, in severe cases, hospitalization and even death. "Reducing exacerbations is absolutely critical to improve outcomes and quality of life for COPD patients," said Vasant Narasimhan, Global Head Drug Development and Chief Medical Officer for Novartis. "The FLAME study has clearly shown that Ultibro Breezhaler is superior to the current standard of care in reducing exacerbations, marking a shift away from therapies containing steroids for the optimal treatment of COPD patients." The results of FLAME confirmed that Ultibro Breezhaler is superior to SFC in reducing exacerbation outcomes regardless of a patient's disease severity and eosinophil levels (a type of white blood cell). Significantly, compared to SFC, Ultibro Breezhaler both reduced the rate of moderate or severe exacerbations with a 17% risk reduction (rate ratio, 0.83), and prolonged the time to the first of these episodes with a 22% risk reduction (hazard ratio, 0.78)1. The safety profiles of the two treatments were consistent with their known profiles. The incidence of pneumonia was higher with SFC than Ultibro Breezhaler (3.2% vs 4.8%: a statistically significant difference). These data were also presented to the scientific community for the first time today at the 2016 Annual Meeting of American Thoracic Society (ATS) in San Francisco, USA. FLAME was a randomized, double-blind, double-dummy, parallel-group, non-inferiority, active-controlled 52-week study involving 3,362 COPD patients and conducted at 356 sites across 43 countries. FLAME is part of the IGNITE Phase III clinical trial program exploring Ultibro Breezhaler for the treatment of COPD. Ultibro Breezhaler 110/50 mcg is a once-daily LABA+/LAMA++ dual bronchodilator approved in the European Union (EU) as a maintenance bronchodilator treatment to relieve symptoms in adult patients with COPD. Clinical trials have shown that it offers statistically significant improvements in bronchodilation compared to treatments widely used as current standards of care, including SFC 50/500 mcg,, and open-label tiotropium (18 mcg). Ultibro Breezhaler is currently approved for use in over 80 countries worldwide, including countries within the EU and Latin America, Japan, Canada, Switzerland and Australia. Novartis is committed to addressing the unmet medical needs of COPD patients and improving their quality of life by providing innovative medicines and devices. The Novartis COPD portfolio includes Ultibro Breezhaler (indacaterol/glycopyrronium bromide), Seebri® Breezhaler® (glycopyrronium bromide) and Onbrez® Breezhaler®/ArcaptaTM NeohalerTM (indacaterol), which are all indicated as maintenance treatments for COPD patients. Glycopyrronium bromide was exclusively licensed to Novartis in April 2005 by Vectura and its co-development partner Sosei. Novartis continues development of respiratory products for delivery via the low resistance Breezhaler® inhalation device, which makes it suitable for patients with different severities of airflow limitation. The Breezhaler device allows patients to hear, feel and see that they have taken the full dose correctly,. Chronic obstructive pulmonary disease (COPD) affects an estimated 210 million people worldwide and is the third leading cause of death. It is progressive (usually gets worse over time), and can be a life-threatening disease,. COPD makes it difficult to breathe, with symptoms that have a destructive impact on patients' function (i.e. activity limitation, decreased mobility) and quality of life,. Exacerbations (disease flare-ups) are a sudden worsening of COPD symptoms that can be "frightening" for patients, causing distress, anxiety and the deterioration of quality of life. COPD exacerbations are also associated with significant healthcare resource burden and costs, particularly due to the frequent need for hospitalization. Consequently, the prevention of exacerbations is an important goal in COPD management to improve long-term health status and conserve healthcare resources. The foregoing release contains forward-looking statements that can be identified by words such as "anticipated," "exploring," "committed," "continues," "can," "goal," or similar terms, or by express or implied discussions regarding potential new indications or labeling for Ultibro Breezhaler, or regarding potential future revenues from Ultibro Breezhaler or any of the products in the Novartis COPD portfolio. You should not place undue reliance on these statements. Such forward-looking statements are based on the current beliefs and expectations of management regarding future events, and are subject to significant known and unknown risks and uncertainties. Should one or more of these risks or uncertainties materialize, or should underlying assumptions prove incorrect, actual results may vary materially from those set forth in the forward-looking statements. There can be no guarantee that Ultibro Breezhaler will be submitted or approved for any additional indications or labeling in any market, or at any particular time. Nor can there be any guarantee that any of the products in the Novartis COPD portfolio will receive additional regulatory approvals or be commercially successful in the future. In particular, management's expectations regarding Ultibro Breezhaler or any of the other products in the Novartis COPD portfolio could be affected by, among other things, the uncertainties inherent in research and development, including unexpected clinical trial results and additional analysis of existing clinical data; unexpected regulatory actions or delays or government regulation generally; the company's ability to obtain or maintain proprietary intellectual property protection; general economic and industry conditions; global trends toward health care cost containment, including ongoing pricing pressures; unexpected manufacturing or quality issues; unexpected safety issues, and other risks and factors referred to in Novartis AG's current Form 20-F on file with the US Securities and Exchange Commission. Novartis is providing the information in this press release as of this date and does not undertake any obligation to update any forward-looking statements contained in this press release as a result of new information, future events or otherwise. Wedzicha JA, Banerji D, Chapman KR, et al. Indacaterol/Glycopyrronium Versus Salmeterol/Fluticasone for COPD Exacerbations. New England Journal of Medicine. 2016. Available at: www.nejm.org/doi/full/10.1056/NEJMoa1516385 [Accessed 15 May 2016]. Vestbo J, Edwards LD, Scanlon PD, et al. Changes in forced expiratory volume in 1 second over time in COPD. N Engl J Med. 2011;365:1184-92. Clinicaltrials.gov. QVA vs. Salmeterol/Fluticasone, 52-week Exacerbation Study (FLAME). NCT01782326. Available at: https://clinicaltrials.gov/ct2/show/NCT01782326?term=NCT01782326&rank=1 [Accessed 10 March 2016]. Ultibro Breezhaler EU Summary of Product Characteristics. Available at: http://www.ema.europa.eu/docs/en_GB/document_library/EPAR_-_Product_Information/human/002679/ WC500151255.pdf [Accessed 10 March 2016]. Vogelmeier C, et al. Once-daily QVA149 provides clinically meaningful improvements in lung function and clinical outcomes versus placebo, indacaterol, glycopyrronium, tiotropium and salmeterol/fluticasone in patients with COPD. [ATS abstract 40759; Session C45; Date: May 21, 2013 Time: 8:15 -10:45]. Vogelmeier C, et al. Once-daily QVA149 provides clinically meaningful improvements in lung function and clinical outcomes. [ERS 2013 abstract 851178; Session 82; Date: September 8, 2013 Time: 12:50-14:40]. Banerji D, et al. Dual bronchodilation with once-daily QVA149 improves dyspnea and health status and reduces symptoms and rescue medication use in patients with COPD: the IGNITE trials. [ERS 2013 abstract 851388; Session 346; Date: September 10, 2013 Time: 8:30-10:30]. Pavkov R, Mueller S, Fiebich K, et al. Characteristics of a capsule based dry powder inhaler for the delivery of indacaterol. CMRO. 2010;26; 11:2527-2533. Global Alliance Against Chronic Respiratory Diseases (GARD). 8th General Meeting. Available at: http://www.who.int/gard/publications/GARDGMreport2013.pdf [Accessed 10 March 2016]. World Health Organization: The top 10 causes of death fact sheet No 310. Available at: http://www.who.int/mediacentre/factsheets/fs310/en/ [Accessed 10 March 2016]. Global Initiative for Chronic Obstructive Lung Disease (GOLD). Global strategy for the diagnosis, management, and prevention of chronic obstructive pulmonary disease. Updated 2016. Available at: http://www.goldcopd.org/uploads/users/files/WatermarkedGlobal%20Strategy...(1).pdf [Accessed 10 March 2016]. Global Alliance Against Chronic Respiratory Diseases (GARD). Global surveillance, prevention and control of chronic respiratory diseases: a comprehensive approach. Available at: http://www.who.int/gard/publications/GARD_Manual/en/ [Accessed 10 March 2016]. Adams R, Chavannes N, Jones K, et al. Exacerbations of chronic obstructive pulmonary disease-a patients' perspective. Prim Care Respir J. 2006;15:2:102-109. Toy EL, Gallagher K, Stanley E, et al. The economic impact of exacerbations of chronic obstructive pulmonary disease and exacerbation definition: a review. COPD. 2010;7:214-28. Anzueto A. Impact of exacerbations on COPD. European Respiratory Review. 2010;19:116:113-118.